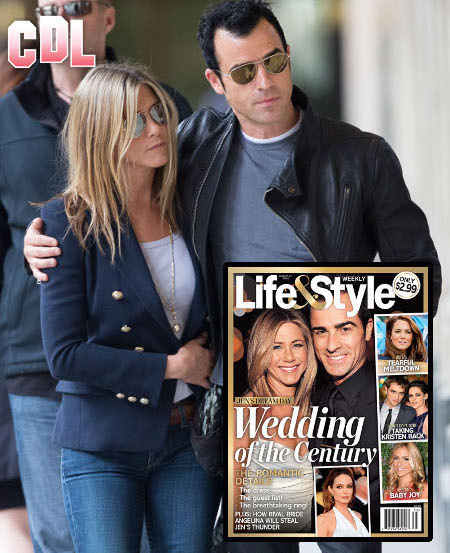 As Jennifer Aniston and Justin Theroux begin planning their dream wedding, one filled with romance and sparkles and glitter and white lace, people can’t help but be a bit skeptical as they begin shoving their futures down the aisle. Some are saying they’ve rushed into it; some are happier than ever for Jennifer, who hasn’t had the best of luck in the male department; and some could care less about this boring and bland couple’s engagement. Regardless of what people are saying, this impending wedding ceremony is a momentous occasion for one reason and one reason only: it will, more than likely, get Justin Theroux out of those black leather jackets of his. On the cover of the new Life & Style Magazine, which will hit newsstands on Wednesday, Jennifer and Justin take center stage. Both of them are beaming, showing those pearly whites, centered behind a giant headlining caption that reads “Wedding of the Century!” Wow, can we be any more dramatic? The magazine promises all the romantic details, including information on “the dress, the guest list, and the breathtaking ring,” which I hear is a stunner. A friend of Jen’s tells the magazine about Jennifer Aniston’s wedding ring: “It‘s a huge emerald-cut diamond. It’s a rectangle with tapered diamond baguettes on the sides.” This friend estimates the ring to be approximately 8 carats. Sounds like she’s got exactly what she wants at the moment. Let’s hope Justin feels the same way. Make sure to leave your thoughts in the comments section below. We’d love to hear from you!